100% Candice: Did Twitter create a Frost Quake? I spent the bulk of today with friends celebrating the marriage of our friends Shane and Robin. I came to know Shane because he is the host of an online game review webseries. Him and my man Nick often work together on videos. Those of us at our table (the rowdy table) would be most commonly referred to as "Creatives". We were a table of animators, videographers, writers and such. So naturally the conversation turned to movies. 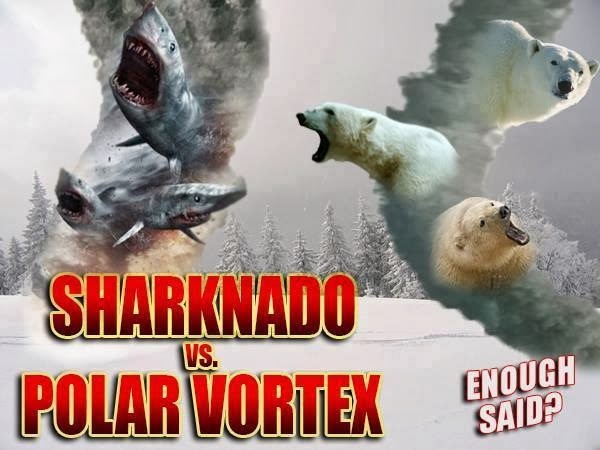 What began as a discussion of the positives and negatives of recent B movie Sharknado quickly turned into the script writing of the best B movie a bunch of people at a wedding can come up with. Needless to say, it's involving sharks. I won't give it away because hopefully you will see it one day as one of the Syfy Originals. Which is how I come around to some weather events that have taken the twitter world by storm and sound like the titles of their own B movies - Frost Quake! Polar Vortex! Many of us have lived in Canada for decades and never heard of these terms which are describing weather we've not often had a chance to experience, or at least those of us who live closer to the US border. Despite our confusion, and BS metres sending up flares, these are not new or made up events. What's new is the immediate communication tool we all use to validate ourselves. Think back a few years to before Twitter and Facebook. Did you ever have an experience where you thought you might have felt an earthquake, or heard weird sounds, heck for the conspiracy theorists, even seen strange lights at night. Who did you tell? Did you wake your neighbours and ask them if they too felt, heard or saw the same thing you did? Did you maybe turn on the radio or the television to see if they were reporting strange events? Did you ever actually take a moment and call the media yourself to report something? I'm betting the answer to most, if not all of those questions, is no. The most you might have done is mention it at the next neighbourhood potluck asking if anyone else noticed something. Or more likely, you just convinced yourself it was nothing, you didn't even notice it. Life went on after the sound or lights or shake just like it did before so who cares what happened? You've probably forgotten. But not now! Now we have an immediate validation engine in social media. Every experience whether banal or extraordinary is shared with our friends and followers. As gregarious human beings we like to know that we are not alone in the world, so when the power goes out we take to Twitter to ask if anyone else's power is out. Sure, there are the 1% of us who take to Twitter to inform the hydro company or the city that something is amiss, but I know when I post about something weird it's to validate that my experience was not in my head, that I am not the only person in this position. So twice this winter season in Southern Ontario we have had extreme cold coming just after mild temperatures which has caused groundwater to freeze at a quicker rate than usual. Water expands as it freezes, so the quick freezing puts a lot of pressure on the ground and makes very loud noise, which us regular folk have been hearing. Off to Twitter to make sure everyone else heard it too. And now you have thousands of people talking about something only meteorologists usually discuss. Frost Quakes, Polar Vortex, even false death rumours are not new things, they are just more quickly spread through social media. Tip - don't immediately believe things to be false or true when you hear about them on social media; take a few moments to look into it before you deny or share.